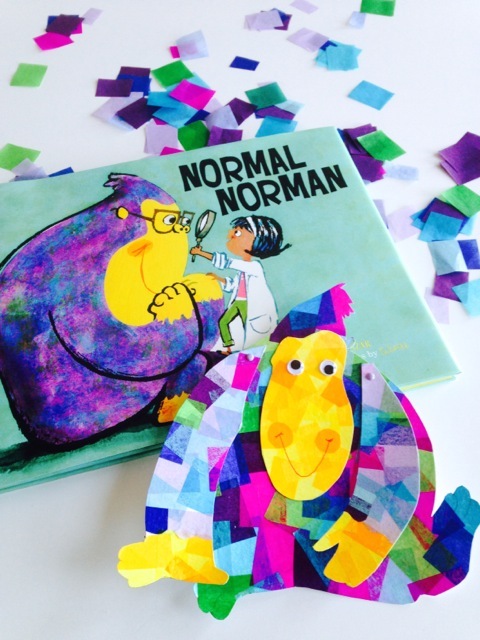 Normal Norman by Tara Lazar, illustrations by S. Britt (2016—out today!). This is a book about trying to define “normal” by way of science—measurements and observations and interview. And I don’t think I’m giving anything away to say that, well, normal is not so easy to pin down. In fact, there may be no such thing as normal at all. The narrator, lab coat on and clip board in hand, proceeds to examine Norman, an orangutan. What I love is that the reader can already tell Norman isn’t normal. I mean, he’s purple and, I adore this detail—he’s wearing glasses. It’s like the reader already knows where this is going and we get to watch as the narrator figures it out. Norman doesn’t like bananas (he likes pizza). Not normal. He doesn’t make animal noises (he speaks English). Not normal. He doesn’t live in the jungle or sleep in a pile of leaves (he sleeps in a bunk bed). Could that be normal? The more we find out about Norman, the more he surprises us. And so do his animal friends. And this is when S. Britt’s illustrations start to remind me of Jolly Roger Bradfield‘s wonderful, imaginative books from the 60s! Those spreads match Norman—they’re colorful and offbeat, full of pizazz and unpredictability. A tiger on a motorcycle, a rhino painting a portrait. The narrator herself abandons her project and makes music and dances and has a rambunctious time with the others. One last thing I love is how the narrator’s science teacher stands by in many scenes. He appears at first to be the arbiter of the narrator’s performance while her project falls apart. But in the end, it’s as though he’s orchestrated this whole thing. He wasn’t looking for a definition of normal—he was looking for her to illustrate its elusiveness. Its absurdity as a notion at all. There is no normal. Just look at Norman! 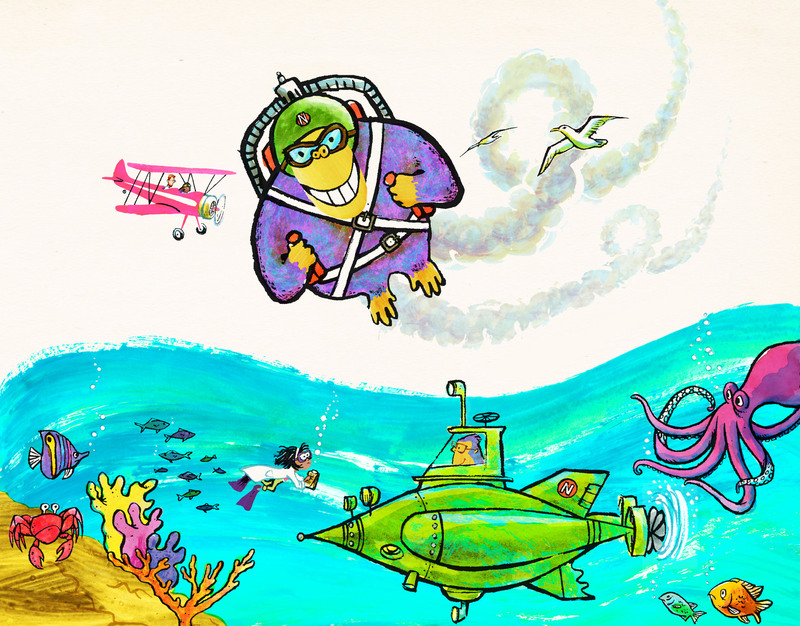 Thanks to Sterling Children’s Books for images! I’m so pleased to host Margaret Muirhead of Homemade City as craft-maker extraordinaire! Margaret loves both picture books and crafts, so mixing the two together sends her over the moon. She is the author of Mabel, One and Only (Dial Books for Young Readers) and a devoted maker of wacky, colorful crafts at Homemade City. By day, you can find her wearing cat glasses and cardigans as the children’s librarian at Hardy Elementary School in Arlington, Mass. Norman is my kind of guy. A dune-buggy-driving, jet-pack-flying, tiara-toting, out-of-the-box orangutan dude. Norman’s multi-hued self is decidedly not orangutan normal, but it is fun-loving, just like the big guy. And tissue paper collage seemed the best way to capture Norman’s coat of many colors. 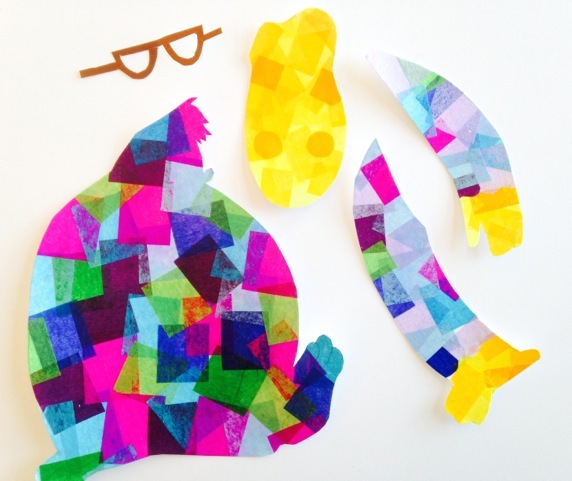 Tissue paper collage is also great because it’s very forgiving in less experienced kid hands–you can smudge, rip, and layer exuberantly, and still the results are delicious. 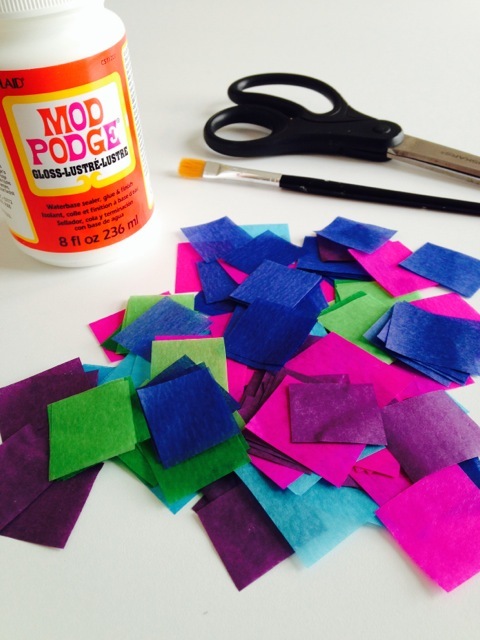 Brush a layer of Mod Podge onto a small area of your shape and cover with tissue squares. Make sure to overlap squares to create new hues. 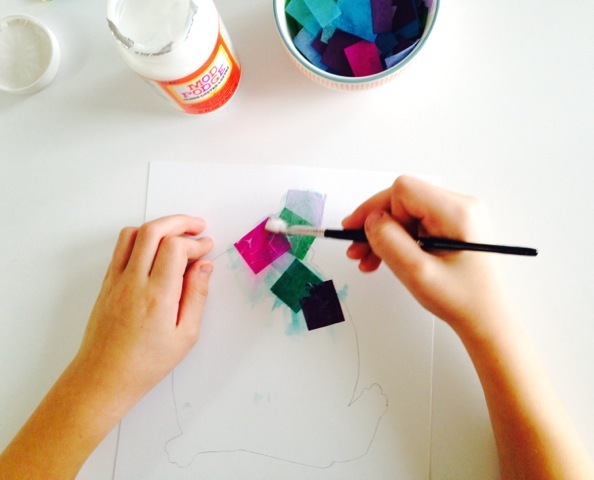 Seal the squares by brushing another layer of Mod Podge over the top of them. Continue in small areas until you’ve covered the shape. Give your collage time to dry. Once dried, cut along the outlines of each shape. Adhere the face with glue or Mod Podge and attach the arms with paper fasteners (to give them a little orangutan swing). Now for the best part: accessorize! Add goggly eyes, brown specs, a teeny tiara and tutu, or even a dual-rocket jet pack (Norman’s preferred not-normal way to get around). 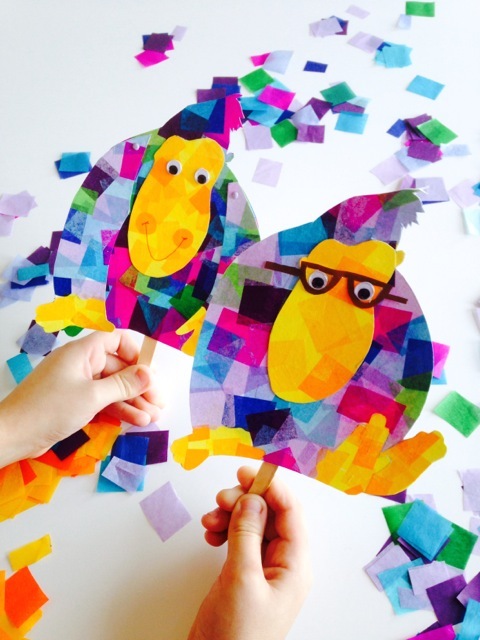 Attach a popsicle stick to the back of your creation to make a puppet. Do not forget to make some friends for Norman: a magenta clarinet-playing hippo, a rollerskating giraffe, a top-hatted snake! Big thanks to Margaret for contributing this incredible, colorful craft! You can see more photos of tissue-papered Norman and other wonderful stuff over at Homemade City. read the book, make a tissue paper collage Norman! ← be a friend + emily arrow’s “be a friend” song + giveaway! Every day is better with a little Mod Podge – and Norman – in it! Love Margaret’s craft – signed up for her blog – and WOW – she is only a few miles away from me. Guess I have used up my “-” quota for the day. Mod Podge is pretty great. Yeah, Homemade City is just that! Margaret writes PBs too—kismet for the two of you! This is such a cool craft, and perfect for Normal Norman–can’t wait to read it!! I didn’t know that, but I love that intel! Thanks, Jilanne. Your Norman tissue paper craft came out lovely!! So happy to be introduced to this book and your blog! 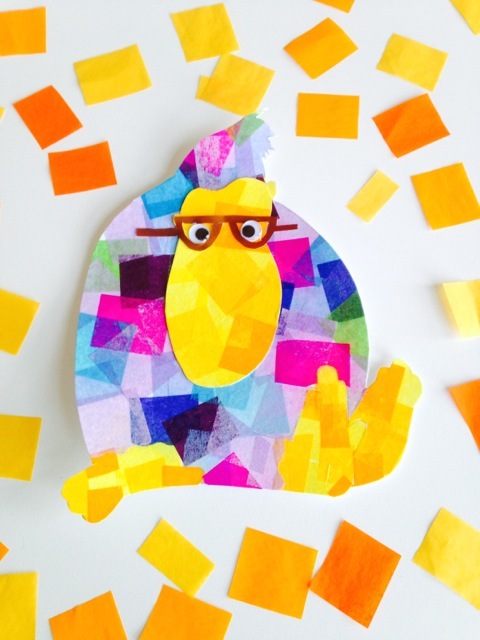 This is a super collaboration–I’d love to see some more character crafts–so much fun!